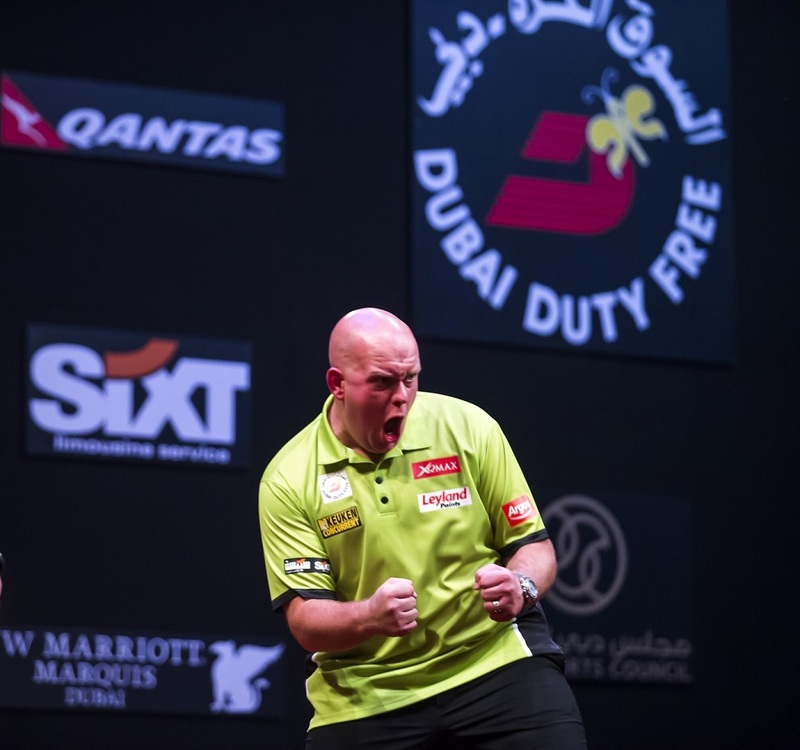 MICHAEL VAN GERWEN landed a brilliant ten 180s to begin his defence of the Dubai Duty Free Darts Masters title with a hard-fought 10-7 win over Peter Wright on Thursday, as Dave Chisnall, Gary Anderson and Phil Taylor also secured semi-final places. 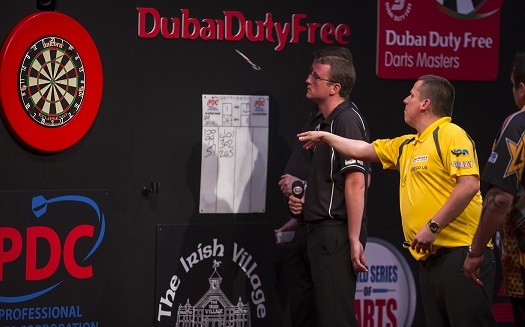 Van Gerwen has been victorious in all three previous Dubai Duty Free Darts Masters events since the World Series of Darts was introduced in 2013, and he kicked off this year's tournament in a game of the highest quality against Wright in the unique outdoor arena. Wright gave as good as he got during a thrilling contest, and led four times as the pair enjoyed a fine duel, but van Gerwen found an extra gear to reel off the final four legs without reply from 7-6 down. After levelling with the aid of a 180, van Gerwen hit a stunning ten-darter to break and move ahead and fired in an 11-dart finish in the next leg before taking out 112 for victory. Van Gerwen ended the match with an average above 107, while his ten 180s was double that of Wright, who averaged 106 in reply only to suffer defeat in a repeat of the 2014 final. "Peter put me massively under pressure and I'm delighted to have produced a performance like this, because I really had to," said van Gerwen, who now meets Chisnall in the semi-finals. "Peter was in great form and he played really well. I'm glad I played that little bit better in the end and it gives me fantastic confidence for tomorrow. Dave's a fantastic player and he did really well tonight and he's capable of doing really good things. I've got to enjoy this moment and make sure I do it again tomorrow. I feel good and I feel confident and I really want to win this title again." Chisnall took out finishes of 130, 110 and 105 and checked out ten doubles from 18 attempts in his impressive 10-1 defeat of Adrian Lewis, as last year's Auckland Darts Masters champion lost out in the quarter-finals. "I'm happy with that," said Chisnall. "My finishing took me through - I wish I could finish like that when I'm playing indoors! Adrian will be disappointed but I took my chances a little bit better than him. My form has been great since I came out of the Premier League and even if it was indoors tonight I probably would have played quite well." 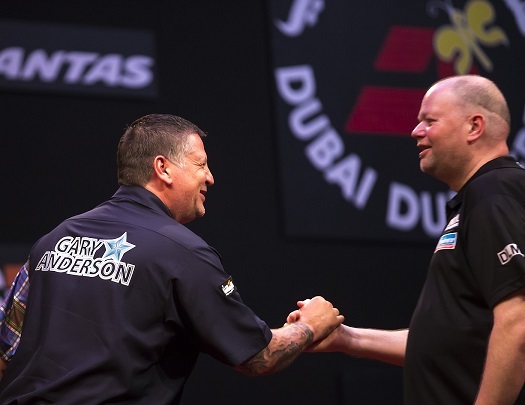 World Champion Gary Anderson impressed with a heavy-scoring display as he defeated Raymond van Barneveld 10-8, hitting 24 scores of 140 or better and two 180s as he overcame the Dutchman after opting to use heavier darts than usual to combat any air movement on the open-air stage at the Dubai Duty Free Tennis Stadium. 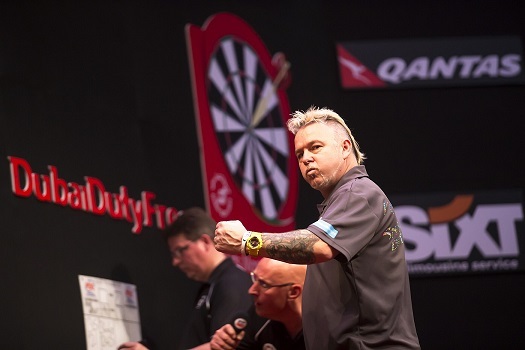 Anderson a turned the game around with five straight legs to move from 3-2 down to lead 7-3, and though van Barneveld threatened a fightback, a 12-dart finish from the Scot secured his semi-final spot. "It was good," said Anderson, who now meets Taylor in the last four. "Even at 3-2 down I was enjoying it. I came with a heavier set of darts and I'm happy with the way they were going - although a few of them curved off that double 13 near the end. I thought I'd try a heavier set - I play with 23 gram darts and these were 25 gram and they went alright, I was happy with them. My 180s weren't there but there were lots of 140s and I'm happy." Taylor, meanwhile, took out finishes of 170 and 110 in successive legs at a key moment in mid-game as he defeated James Wade 10-2, book-ending the performance with 13-darters, hitting three 180s and taking the final six legs without reply. "Getting the win was the important thing and I've done that, but I think I played quite steady darts, I was solid and I can improve on that," said Taylor. "The 170 was perfect and the 110 finish was great too. I thought James, at 4-1 down, was up against it but he's one of those players you can't relax against and even at 8-2 I thought he was going to come back so I had to get the job done."